Delivering comprehensive ergonomics services to large or distributed office populations is challenging, time consuming and very expensive. Sending qualified ergonomics professionals is often difficult to arrange, disruptive to the workflow, and for many routine office ergo issues, is not always necessary. Instead, a new hybrid approach combining on-line learning and self assessments with tele-consults and, if necessary, on-site professional services is proving to be very effective at reducing service delivery costs, while improving availability and outcomes. Can you scale up to reach all sites? Can you respond quickly and effectively to requests for assistance? Can you get your experts out to where they are needed? Do you have a significant budget for travel and other service delivery and follow-up costs? If you can’t answer “yes” to all of these you should consider our hybrid 3-pronged approach, described below, to deliver your ergonomics services. Staffing: The traditional approach requires considerable staff time and headcount. Distance: Serving large or distributed offices requires significant travel time, even if it’s just walking around the campus. Time: Sending experts to meet one-to-one with everyone requires considerable staff time. And taking people off the phone queue for ergo consults does not allow much time for assessing the root causes and providing meaningful corrective actions. Retention: If you are able to provide comprehensive services, learning theorists tell us that most of your advice is forgotten within hours or days. Boredom: The problems and solutions you see may be quite common from user to user. You may get bored, fatigued or even loose your voice as you attempt to show employee after employee your favorite ergonomics tips and guidelines. High costs: One-to-one, or analog delivery of ergonomic services can get very expensive. A staffer can cost $50 + per hour while consultants can range from $100 – $250 or more per hour. Level 1: On-line tools provide the basic ergonomic instruction and help to resolve many common issues with no need for a site visit. A high quality on-line program will provide the participant with a flexible learning environment that allows them to progress through the training and risk assessment at their own pace. The program should offer self-corrective advice that is meaningful to the learner and be specific to their concerns and their organization. 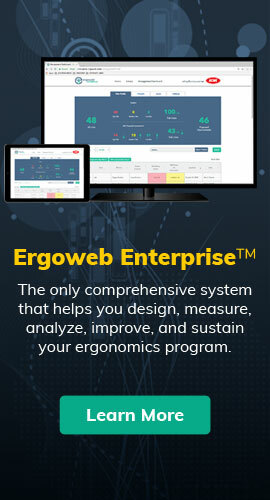 The best on-line programs make it easy to perform surveillance and to identify those users who have unresolved ergonomics issues that warrant more specific guidance. The best on-line programs also include a collection of reference materials that provide the participant with deep and rich learning experiences, and these materials are available for future reference, while also facilitating advanced Level 2 services. Level 2: Remote telephonic consults can effectively extend your reach and allow you to “see” the employee at their workstation without traveling to their location. L2 consults are facilitated by utilizing shared content in the Help Library, a detailed listing of the learners’ ergonomic concerns combined with specific photographs and measurements of the employee’s remote workstation. Level 3: On-site ergonomic consults are judiciously used for the most complex and involved cases. Ergonomics experts travel on-site when a user has significant concerns that haven’t been resolved through an L2 remote consult. 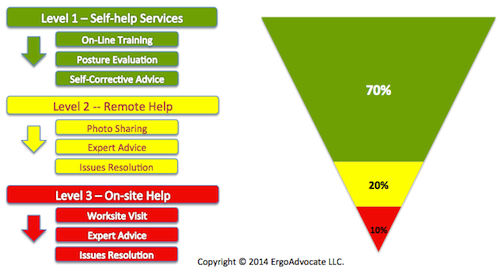 We also send experts on-site if there are multiple users with ergo concerns at the same location. However, we do require all L3 participants to first complete the on-line training and to attempt to implement the recommended self-corrective advice before our experts travel to meet them on-site. Having the participants first complete the on-line training ensures that the face-to-face time is spent talking about advanced ergonomics application and adjustments, not just learning the “Goldilocks” story about ergonomics. Utilizing this 3-pronged approach for office ergonomics has allowed our clients to turbocharge their service delivery. Our clients are simultaneously serving more learners, traveling less, while reducing ergonomic risk, service delivery costs, and the costs associated with poor ergonomics. We are effectively resolving as many as 90% of our clients ergonomic concerns with Level 1 + Level 2 services — no travel and no waiting for advanced services to be delivered! Level 1: Invest in a good, high-quality on-line ergonomics program that provides your learners with a risk assessment and immediate self-corrective advice. Level 2: Gear up for Remote Services. Use your existing ergonomics specialists, or contract with us to work under your guidance. Customize a library of self- and remote-help resources, including a listing of your commonly recommended solutions & preferred products, and detailed descriptions of the procedures for getting things done at your company (how does the department order supplies, or place a facilities work order, how do you fulfill requests for specialty items…). Level 3: Staff or consultants available to provide desk-side service at your sites. Use our staff if desired.